When Nephi asked the Spirit of Lord the meaning of the tree seen in his father’s dream (1 Nephi 11:11), the Spirit seemingly changed the subject, and called Nephi’s attention to “a virgin.” Nephi said that “she was exceedingly fair and white,” and “most beautiful and fair above all other virgins” (1 Nephi 11:13, 15). As this vision proceeds, Nephi sees this woman “bearing a child in her arms” (1 Nephi 11:20), and the angel escorting him told Nephi that she is “the mother of God, after the manner of the flesh,” as found in the original text.1 From this vision, Nephi somehow comes to understand the meaning of the tree of life (1 Nephi 11:21–22). In 1998, Daniel C. Peterson noted a fundamental connection between the tree and virgin. The adjectives describing the virgin (“most beautiful,” “exceedingly fair,” “white”) compared to those describing the tree (“exceeding all beauty,” and “exceed[ing] the whiteness of the driven snow”), are synonyms (1 Nephi 11:8). As Peterson goes on to explain, scholars have recently come to accept that in ancient Israelite religion, there was a belief in a divine mother goddess named Asherah, who was represented by the tree of life. The symbolism is widespread throughout the ancient Near East, and can be seen in association with different goddesses by various cultures. Nothing is more important in Christian worship than to recognize Jesus Christ as the Son of God, born of a virgin, who became flesh as the express image of his Father (John 17:3; Hebrews 1:1–3). The Book of Mormon, as another witness and covenant of God, testifies “that Jesus is the Christ, the Eternal God” as he “manifest[s] himself unto all nations” (Book of Mormon Title Page). The ancient abridger Mormon testified that he had written this book “for the intent that ye may believe” the Bible, and so that modern people may know of the marvelous and miraculous works that have been brought to pass “by the power of God among them” (Mormon 7:9). The notion of a divine mother goddess strongly resonates with Latter-day Saint belief in a Heavenly Mother.5 While Mary is not to be identified as Heavenly Mother, the ancient Israelite and Egyptian cultural backgrounds shed light on Nephi’s vision and how he made sense of imagery. Just as Israelite and Egyptian religions associated a sacred tree with a mother of gods and kings, so Nephi’s guide tied the idea of the tree of life together with the “mother of God, after the manner of the flesh,” whose child was the Messiah, the true Davidic King. 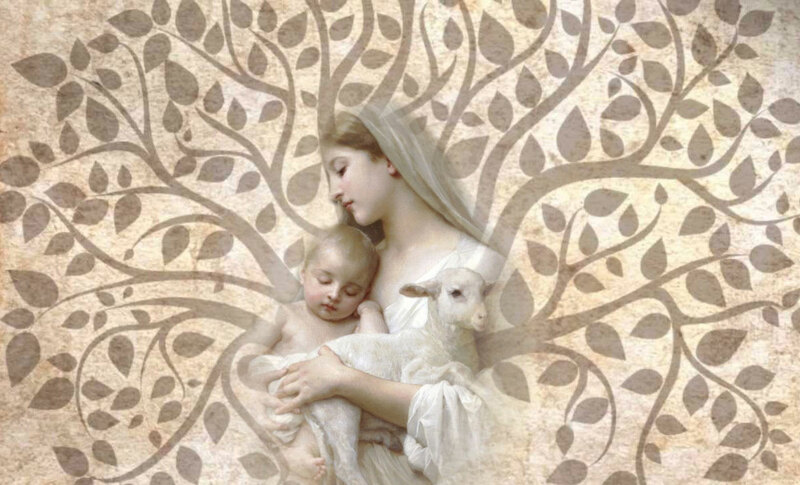 David L. Paulsen and Martin Pulido, “‘A Mother There’: A Survey of Historical Teachings about Mother in Heaven,” BYU Studies 50, no. 1 (2011): 70–97. Samuel Zinner, “‘Zion’ and ‘Jerusalem’ as Lady Wisdom in Moses 7 and Nephi’s Tree of Life Vision,” Interpreter: A Journal of Mormon Scripture 12 (2014): 281–323. John S. Thompson, “The Lady at the Horizon: Egyptian Tree Goddess Iconography and Sacred Trees in Israelite Scripture and Temple Theology,” in Ancient Temple Worship: Proceedings of The Expound Symposium, 14 May 2011, ed. Matthew B. Brown, Jeffrey M. Bradshaw, Stephen D. Ricks, and John S. Thompson (Orem, Utah: Interpreter Foundation and Eborn Books, 2014), 217–241. Daniel C. Peterson, “A Divine Mother in the Book of Mormon?” in Mormonism and the Temple: Examining an Ancient Religious Tradition, ed. Gary N. Anderson (Logan, Utah: Academy for Temple Studies/USU Religious Studies, 2013), 109–124. Margaret Barker, “The Fragrant Tree,” in The Tree of Life: From Eden to Eternity, ed. John W. Welch and Donald W. Parry (Salt Lake City, Utah: Deseret Book and Neal A. Maxwell Institute, 2011), 55–79. Margaret Barker, “Joseph Smith and Preexilic Israelite Religion,” in The Worlds of Joseph Smith, ed. John W. Welch (Provo, UT: Brigham Young University Press, 2005), 69–82. Daniel C. Peterson, “Nephi and His Asherah,” Journal of Book of Mormon Studies 9/2 (2000): 16–25. Daniel C. Peterson, “Nephi and His Asherah: A Note on 1 Nephi 11:8–23,” in Mormons, Scripture, and the Ancient World: Studies in Honor of John L. Sorenson (Provo, Utah: FARMS, 1998), 191–243. 1. Royal Skousen, ed., The Book of Mormon: The Earliest Text (New Haven, CT: Yale University Press, 2009), 29. 2. Daniel C. Peterson, “Nephi and His Asherah: A Note on 1 Nephi 11:8–23,” in Mormons, Scripture, and the Ancient World, ed. Davis Bitton (Provo, UT: FARMS, 1998), 194. 3. John S. Thompson, “The Lady at the Horizon: Egyptian Tree Goddess Iconography and Sacred Trees in Israelite Scripture and Temple Theology,” in Ancient Temple Worship: Proceedings of The Expound Symposium, 14 May 2011, ed. Matthew B. Brown, Jeffrey M. Bradshaw, Stephen D. Ricks, and John S. Thompson (Orem, Utah: Interpreter Foundation and Eborn Books, 2014), 225–226. 4. Peterson, “Nephi and His Asherah,” 196–198. 5. See “Mother in Heaven,” online at https://www.lds.org/topics/mother-in-heaven?lang=eng (accessed October 28, 2015). 6. Samuel Zinner, “‘Zion’ and ‘Jerusalem’ as Lady Wisdom in Moses 7 and Nephi’s Tree of Life Vision,” Interpreter: A Journal of Mormon Scripture 12 (2014): 313. 7. Margaret Barker, “Joseph Smith and Preexilic Israelite Religion,” in The Worlds of Joseph Smith, ed. John W. Welch (Provo, UT: Brigham Young University Press, 2005), 76.